Winning with breakthrough Hispanic Knowledge - Culturati Research & Consulting, Inc. - Culturati Research & Consulting, Inc. Appealing to our multicultural nation requires continuous cultural intelligence and sensitivity which can only be achieved through the continuous commitment to learning about cultural characteristics and values that impact affinity with brands. It is about going beyond loyalty and achieving stronger connections that can only be established by truly embracing cultural diversity and uncovering life insights that will help brands pull on consumer’s heart strings. This can only be achieved through the deep understanding of beliefs, attitudes, tensions and motivators – which will result in the opportunity for brands to effectively address pain points and create solutions for articulated, or better yet, unarticulated needs. Therefore, Culturati has created a best-in-class, attitudes-based acculturation model that allows teams to lean forward and leverage cultural intelligence to win with this burgeoning segment of the total market – which has also proven itself to have great influence on the non-Hispanic population. 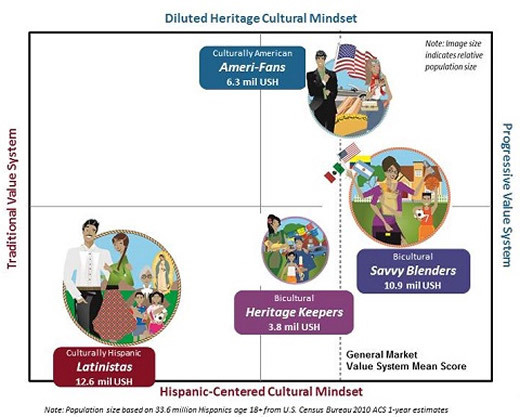 Our data-driven, attitudes-based model profiles consumers along two key dimensions, Cultural Mindset and Value System, to form four distinct, actionable Hispanics segments. Click Here and watch the short video below for more information about this breakthrough Acculturation Model, and contact us to discuss how you may apply this knowledge to Inspire, Illuminate and Influence your teams and drive greater growth for your brand.